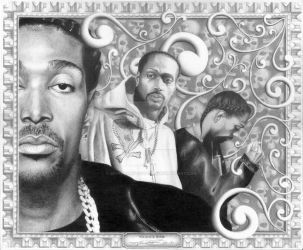 This artwork was used for Krayzie Bone's Fixtape 3: Lyrical Paraphernalia. It was a complete dream-come-true! The artwork is features on the CD and under CD within the album design. First of a new series of artwork to illustrate different themes of Buffalo football with an original character that I created and developed. This "Lead The Charge" pencil drawing is on 14" x 17" bristol paper. 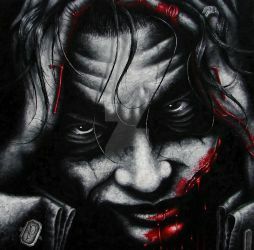 Limited edition to 50 giclee prints on 17" x 26" enhanced velvet paper are sold through my website (BiondoArt.com) with help from a local Buffalo, NY company 26 Shirts to help benefit people in need. This particular print helped the Brian Moorman's PUNT Foundation. It's a sincere honor to be working with these great people! u selling some o dose hiphop series stuff? Noticed you havent logged on in 7 weeks. I'm gonna get a picture of your BTH oil painting to BTH and see what they think. Impressive. Keep up the good work.